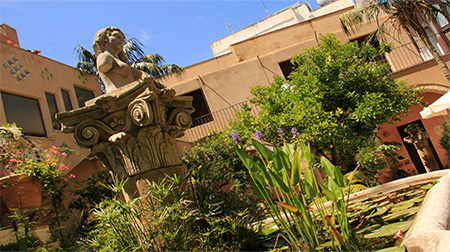 Antica Corte delle Ninfee (The Ancient Court of Waterlilies) is an ex- convent of the fifteenth century located in the very center of Trapani city, nowadays the property and private mansion of the Marrone family. It has been recently renovated by the heirs after 40 years of being abandoned for the reason of family’s life away. The architect and engineer Decio Attilio Marrone (1880 – 1976) turned the Old Dominican convent in the historical center of the baroque city into the family home. The Trinity chapel (chiesa della Trinità) attached to the complex became his studio. Being a talented person and responsible professional Decio Marrone took charge of the restoration not only of the monastery complex to historical levels, but also of many other important diocesan architectural structures in Sicily, especially after the Second World War. He was commissioned to the construction of the canopy of the Church of Maria SS. Annunziata in Trapani, becoming Superintendent of Cultural Heritage of Western Sicily. The woman who became his wife, Renata Lombardo (1901 – 1989), at that time director of the Academy of Fine Arts in Trapani, collaborating with Marrone in his studio had created and realized the project of the crown of Our Lady of the Annunciation (Maria SS. Annunziata). 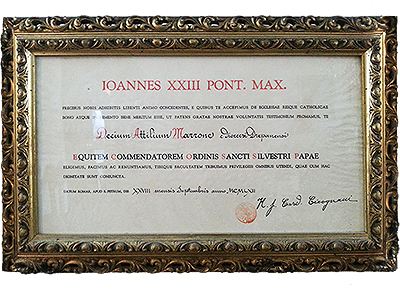 Pope John XIII September 28, 1962 honored Decio Marrone the title of Il Commendatore (the commander) for the passion dedicated and distinguished work for the benefit of country in a difficult political and economic period. 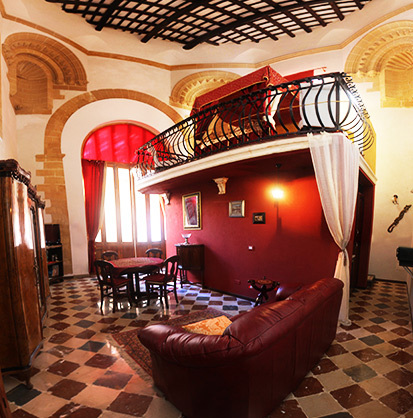 The Antica Corte is located in the area of Trapani called San Domenico. It refers to 1230s when the Dominicans had constructed a new church on the ruins of the church of Santa Maria la Nova. 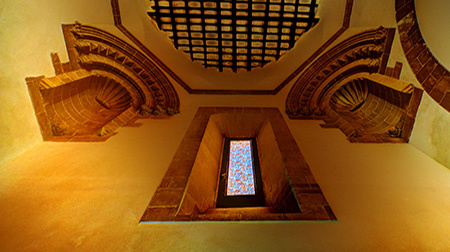 The underground passageways connected the Dominican Church and the two monasteries (the monastery and the convent – Antica Corte) by means of tunnels deep under the ground where the ancient Phoenician city remained hidden. The chapel “Crusaders” in the crypt of the Church of San Domenico was discovered and excavated to the final point where frescoes have emerged. 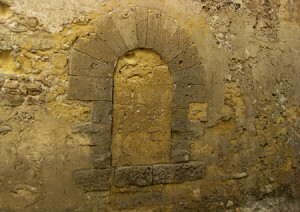 Another important historical feature of the complex – the old “wheel” – the passage currently walled but recognizable from the outside of the Trinity Chapel. It was used to leave orphans in care to the nuns, it names the side street of the current structure via Orfani. After years of neglect the heirs of the Marrone and the Cipresso families have launched restoration process bringing the house back to its original splendor. In the area below they have made 3 independent apartments available for tourist use with access from the botanical garden, that represent an amazing combination of classic and elegant design with provided by ultra-modern facilities comfort. 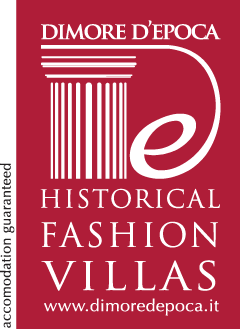 Family of artists and fans of art and culture, the owners have decided to open the doors of this place that is the part of the history of a city and the part of the history of Italy, organizing exhibitions and events to all who is passionate about beauty and aesthetics. Luna Stanford Marrone is available as a guide to anyone who wishes to get to know Antica Corte’s cultural and human heritage and to immerse into history and art-spirit of this place, that history has to offer guests many interesting features where even the legends are the background to life. The historical confectionary “La Rinascente” situated on the corner of via Badia Grande and via Gatti and making the part of the complex offers every day to local people and guests of Trapani fresh exquisite traditional sweets. With its long story (established in the middle of twentieth century) it continues following the typical recipes used by nuns in previous epochs. The Marrone family is proud of based on mutual respect friendship between them and the Costadura family who run the pastry shop.